The process of searching, evaluating, purchasing, and deploying an Enterprise Resource Planning (ERP) solution is not as simple as it once was. There’s no such thing as a one-size-fits-all approach when it comes to ERP software. Solutions today come in a variety of different flavors, each features a particular set of capabilities, strengths, and drawbacks. Choosing the right vendor and solution is a complicated process—one that requires in-depth research and often comes down to more than just the solution and its technical capabilities. Here at Solutions Review, it’s our job to help simplify that process. To that end, we’ve created a variety of buyer resources and articles to speed the evaluation of enterprise technology solutions. 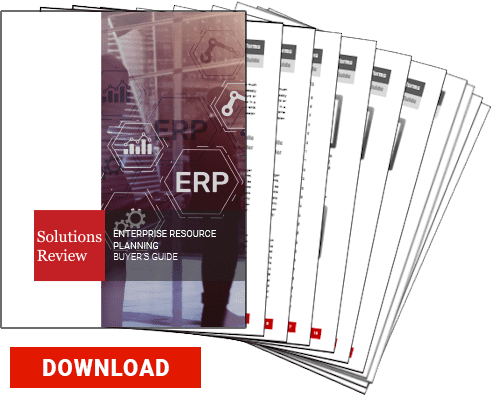 In our Enterprise Resource Planning Buyer’s Guide, we offer readers a full ERP market overview. This includes company and product profiles and best use cases for the top-24 providers, ten questions for prospective ERP buyers, and our bottom line analysis. Customer Reviews / References: Customer reviews can go a long way, so don’t be afraid to ask for customer references to get their opinions, first hand, whether or not the ERP tool you are looking at fits the description. But make sure these customers actually purchased the vendor’s software. Were they happy with the software and services? Why or why not? To make it even easier for buyer’s that may be in niche and specific industries, we’ve gone even further by creating two more ERP buyer’s guide. Our Manufacturing ERP Buyer’s Guide includes the top-24 ERP providers that offer strictly ERP solutions for the manufacturing industry. Similarly, our Distribution ERP Buyer’s Guide focuses on vendors that provide solutions for the wholesale distribution industry. Although some of the solution providers in the Manufacturing Guide bleed into our Distribution Guide, it’s helpful for some to see the specific solutions (and the differences) in order to pick one that best fits their businesses/organizations needs. Pair these with Solutions Review online directory of ERP vendors, platforms and software solutions. It includes an abbreviated overview, contact information and links to each company’s social media handles for the top-24 ERP providers. If you would like a printed version of this page including complete solutions profiles and a list of the top questions to ask in an RFP, click here for a free PDF. So, if you’re in the beginning process of buying your first ERP solution, or if you’re looking for something a little different than what you already have, we hope these are the perfect resources to get you started on the decision-making process.